In the streamlined realm of summer beauty, glowing skin and clean, shiny locks go a long way. (Just throw on tinted lip balm, a fresh nail polish colour, and oversize shades and you're good to go!) 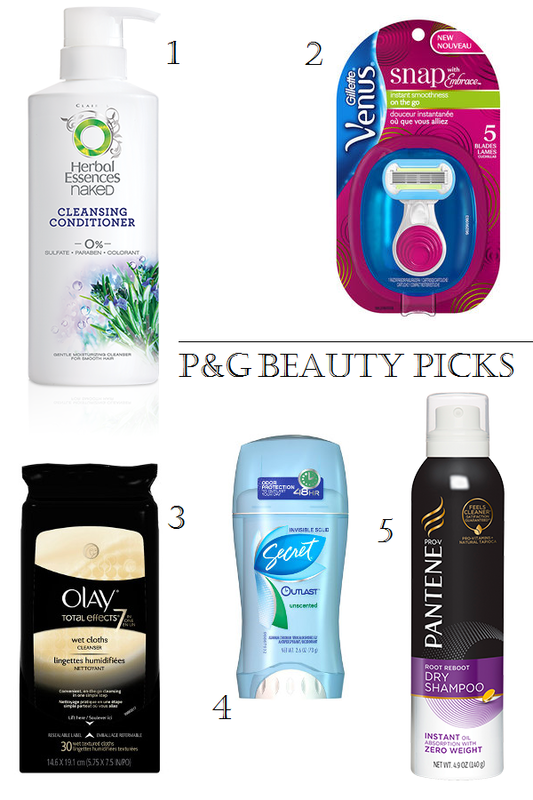 I've been test-driving and loving these new essentials from P&G Beauty for the last month. Terrific for surviving summer, yes, but also for year-round use. 1. Herbal Essences Naked Cleansing Conditioner ($5.98 at London Drugs) gently refreshes and smoothes hair with its low-suds formula. This is an effective yet mild solution for those times when you need to wash the chlorine out after a dip in the pool or revive sweaty locks post-run, but a full shampoo would strip strands of moisture. 2. I've cooed over the Gillette Venus Snap Shaver ($15.99 at London Drugs) on Instagram already, but I'll do it again here. This little 3" razor delivers a comfortable shave and surprisingly ergonomic grip. All that and a little ventilated blue carrying case to boot! Great for travel or the gym bag. 3. Olay Total Effects Wet Cleansing Cloths don't just remove makeup, they deliver a total cleansing experience that leaves skin feeling soft and residue-free. Use them to fight makeup meltdown on the go, or when you're too tired to go through your full nighttime cleansing regimen after a full day of summer adventuring. 4. Secret Outlast Anti-Perspirant ($3.99 at London Drugs) helped me survive the worst of Vancouver's recent heat wave; one application definitely lasts 24+ hours. If that's not a ringing endorsement, I don't know what is! 5. No time to lather up? No problem. Pantene Root Reboot Dry Shampoo ($3.99 at London Drugs) absorbs oil without any telltale white residue thanks to its tapioca-based formula. I like to spritz my roots and massage and brush in the dry shampoo, then braid my hair into an updo.